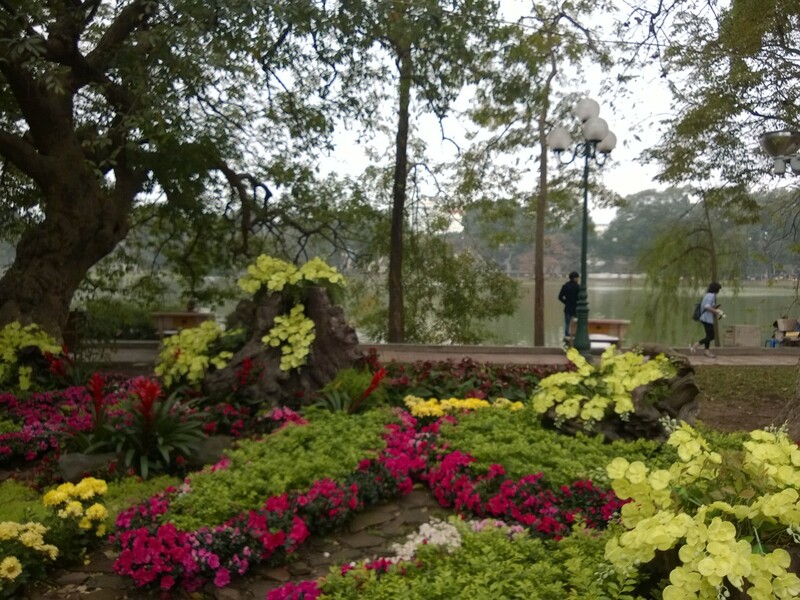 Flowers are blooming in Hanoi! It was lovely to see the ladies dancing in Vietnam just like they do in China. They had their loud speakers going and were working it! 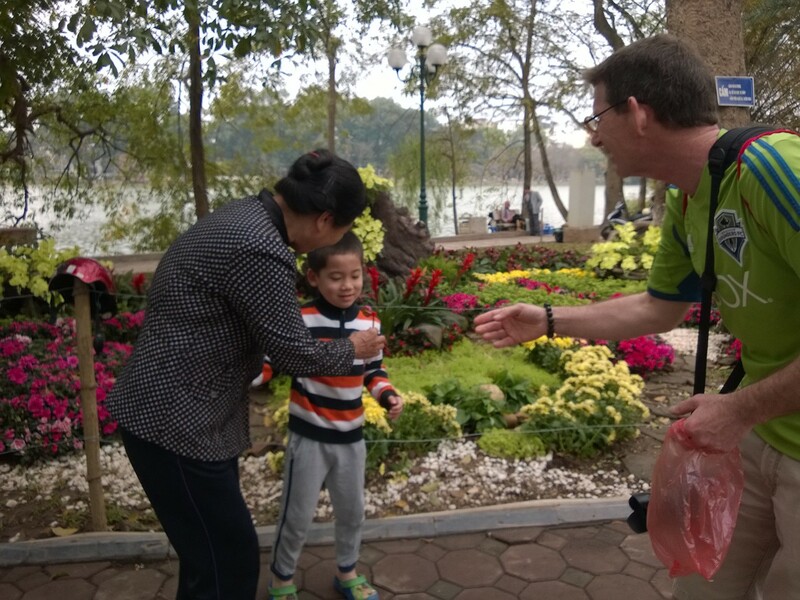 Our only day to enjoy Hanoi, we decided to walk around Hoan Kiem Lake today and enjoyed the warm weather. This lake is in the heart of the Old Quarter in Hanoi and seems to be enjoyed by all the locals. From the lovely pagoda in the middle of the lake to the bridge over to an island, the flowers were blooming everywhere. This is the one public space we have seen in Vietnam that is in good repair and maintenance. There is a nice walking path around it and we are looking forward to enjoying the lights that are strung up between the trees tonight as we plan an evening walk. There is a café on the lake as well as several restaurants with a view of the lake for everyone to enjoy. On the first walk around the lake, we not only saw ladies dancing but many families out taking a walk and street vendors selling their wares. After we had gotten almost the whole way around, Thom turned to me and proposed an adventure. We would walk back, find the “seasoned” lady selling wooden children’s toys and buy them all. Thus, she could enjoy a well deserved day off and we would then spread some love around the park by giving away the toys. Done and done. Oh what fun we had on this Vietnam “pay it forward” project. First, several gentlemen came to the lady’s aid when they thought we might be trying to swindle her. No, we reassured them that we really wanted her to have 500,000 dong to buy all the toys she had to sell. They were shocked and laughed. She smiled. Then, off we went around the park with Thom approaching any and all children and giving away the toys. Another vendor selling cards found out what we were doing and encouraged us to find the children from the “working” families and give them the toys. This, we tried to do. While we mainly got smiles and nods, Thom did manage to scare a few children with his goofy smile and outgoing positivity. Hopefully, stories will be told of the tall smiling Laowai wearing the bright green Xbox Sounders shirt and the joy he tried to bring to the children in the park. For us, it will be a very fond memory and may become a new tradition of spreading joy throughout the world as we enjoy great adventures wherever we go.